JET Rapid at work: 128,000 electrically charged ink drops fly towards the gutter every second. When hunting, a lion can run at speeds of more than 60 km/h. 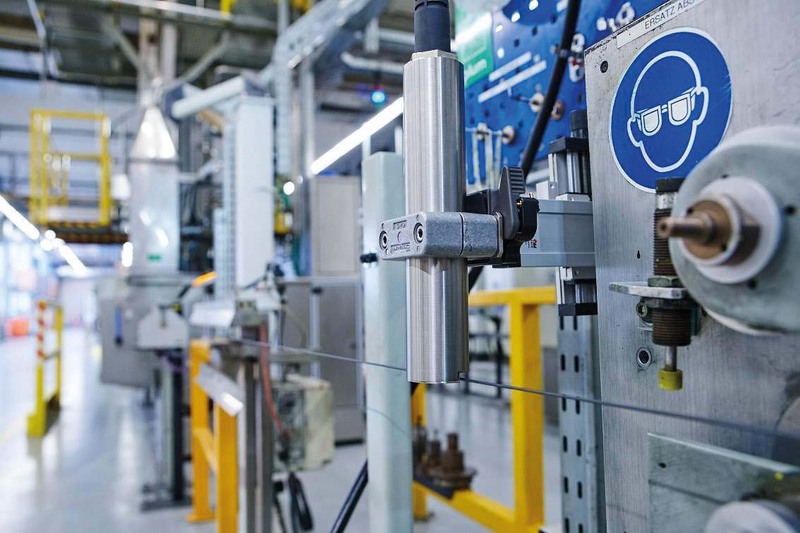 Modern cable extruding machines operate at a similar pace. The problem: marking systems run the risk of creating bottlenecks in production. The solution from Paul Leibinger GmbH & Co. KG: JET Rapid –one of the world’s fastest continuous inkjet (CIJ) printers, that can keep up with speeds of up to 1,000 m/min. Its users include cable manufacturers such as HUBER+SUHNER from Pfäffikon in Switzerland. As part of the cable manufacturing process, electrical or fiber optic wires shoot through extruders which coat them in a protective outer layer made of materials such as Teflon or PE. Top of the range production systems are getting faster and faster: some of them now able to operate at up to 60 km/h. These are speeds that threaten to bring the printers located downstream of the extruders to their knees. The manufacturer’s name, logo, batch number and length label become distorted and, in the worst case, completely illegible. 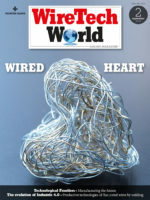 The consequences present a real challenge to many cable manufacturers: if the printer hits its limit for a mere two minutes, two kilometers of expensive cable will end up in the trash. So, how can production be made more reliable? Handles all cable thicknesses and materials (PE or silicone) with equal ease: the JET Rapid’s ink dries in less than a second but lasts for years. The printer’s automatic Sealtronic closure system, which is unique in this sector, also gives it exceptional reliability. The gutter is retracted and the nozzle is closed to create an airtight seal when the printer is not working. This prevents the ink from drying out and blocking the nozzle. As a result, there’s no need for time-consuming cleaning. But what makes this “Made in Germany” printer so efficient? It’s the continuous inkjet (CIJ) technology, which mathematicians, engineers and electricians have perfected thanks to decades of research and testing. As a result, the printer can print at a rate impossible for the human eye to see. A minute spray nozzle in the cylinder-shaped printhead, mounted above the cable, fires 128,000 electrically charged ink drops towards the gutter every second. A high voltage field between the gutter ends changes the trajectory of the individual ink drops. The drops land on the cable as pixels, and are dry in less than a second. 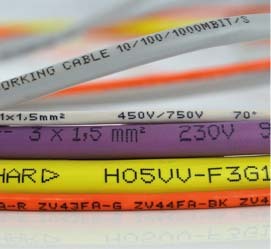 Information such as the manufacturer name, data matrix code and graphics appear on the cable as if painted by an invisible hand. And not just in black, yellow and blue: in a recent development, the JET Rapid can now even print easily readable, white text on black cables, by using specially pigmented inks.